Why are so few tongue region procedures performed for the treatment of obstructive sleep apnea? Home | Sleep Apnea | Why are so few tongue region procedures performed for the treatment of obstructive sleep apnea? Posted October 22, 2012 by Dr. Kezirian & filed under Sleep Apnea, Surgery, Tongue Surgery. Sleep surgery is the surgical treatment of snoring and obstructive sleep apnea. For many years, there was only one procedure (called uvulopalatopharyngoplasty, or UPPP) to treat these problems. Although UPPP clearly helps many patients, it has some important limitations that I have discussed in a previous blog post. For both snoring and sleep apnea, many procedures have been developed over the past 15-20 years to address these limitations. These other procedures generally fall into those that treat snoring alone by dampening the sound of snoring or those that treat obstructive sleep apnea by creating more space for breathing. Many studies have shown that the best results in sleep surgery depend on determining what parts of the throat contribute to snoring and sleep apnea and then choosing from the wide range of surgical options, according to their individual patterns. I (and others) generally divide the throat into a so-called Palate Region and a Tongue Region. UPPP is one procedure available to treat blockage in the Palate Region, but other procedures include expansion sphincter pharyngoplasty, lateral pharyngoplasty, Z-palatoplasty, relocation pharyngoplasty, and some others. For the Tongue Region, the array of procedures includes epiglottis surgery, genioglossus advancement, hyoid suspension, lingual tonsillectomy, midline glossectomy, and tongue radiofrequency. My research and that of others has shown that 60-80% of patients have blockage not only in the Palate Region but also in the Tongue Region. Particularly in studies of the last 10 years, this has been shown in many kinds of evaluations, whether done awake in the office or under sedation with a technique that we have named drug-induced sleep endoscopy. Although blockage in breathing often occurs in both areas, one of my recent studies showed that over 75% of sleep apnea procedures in the United States consist of Palate Region surgery alone. The breakdown of procedures is presented below. The combination of common Tongue Region obstruction but uncommon Tongue Region surgery leads to the question that is the title of this blog entry: why are so few tongue region procedures performed for the treatment of obstructive sleep apnea? So why is sleep apnea surgery so often limited to the palate? We set out to examine this question with a study published in the November 2012 issue of the journal Otolaryngology—Head and Neck Surgery. In short, this study examined the importance of the following factors affecting procedure selection for Tongue Region (also known as hypopharyngeal) surgery: education and training, scientific evidence, surgeon personal experience, patient preferences, and health insurance coverage. One key theme was that many surgeons reported that they did not have the education and training to perform many of these procedures. A previous study had shown that many residency programs are not currently training their residents in Tongue Region procedures. Our study emphasized how important (not to mention enjoyable) it is to train our residents and many visiting surgeons from around the world as I perform the procedures on my own patients and also to teach others with lectures at courses and scientific meetings. Many surgeons were concerned that the scientific evidence regarding tongue region surgery is not as good as they would like. I certainly agree. The challenge is that surgical research is very different from studies of medications, which makes it very difficult or impossible to perform the perfect studies like randomized trials (for example, it is possible to give someone a sugar pill to evaluate a possible placebo effect for medications, but there is no such option when it comes to sleep apnea surgery). That being said, the evidence supporting an essential role for tongue region surgery comes from many studies showing that outcomes are improved with the combination of Palate and Tongue Region compared to Palate Region surgery alone. A side note about the evidence regarding Tongue Region procedures is that all of these are not created equal, so to speak. Some patients do better or worse after certain procedures, which is why one of the most common topics on which I speak is how to select from among the various tongue region procedure options for specific patients. The other factors were also important in procedure selection, especially regarding specific procedures. For example, patient preferences were most important in the decision not to proceed with maxillomandibular advancement. Patients, of course, should and do always make the final decisions on any surgical treatment plan, after full discussion of risks and benefits. However, this survey showed that patients often are not interested in maxillomandibular advancement, in spite of having it recommended by a doctor, perhaps because of the increased risks and recovery that are involved compared to alternatives. As a surgeon or patient, what should I do? This study explains the discrepancies between the fact that few Tongue Region procedures are being performed and the more-recent evidence that the Tongue Region is critical in sleep apnea. For surgeons, it points to the need for increasing the education and training of surgeons and conducting better and more research studies to learn which procedures achieve the best outcomes in sleep apnea—and in which patients. For patients, it reinforces the need to be a good consumer. 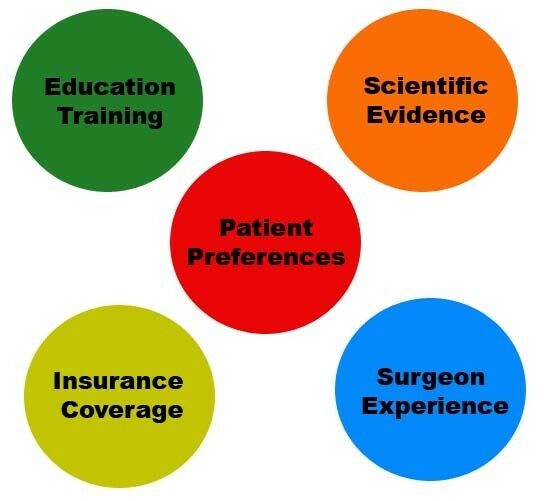 Feel free to ask your surgeon (or any physician) why they are recommending specific treatment plans. For patients who are considering sleep surgery, they should ask their surgeon if they are trained in multiple procedures and why a certain procedure (or procedure combination) is the best option for them. Patients should have a treatment plan that is tailored to them, whether it be for surgical or nonsurgical treatment, and any blanket recommendation that a physician applies to all patients deserves to be questioned. Patients ask me all the time if I mind their questions. In fact, the reverse is true. Any physician should welcome questions and be able to explain the reasoning behind a treatment plan so that a patient understands it. perhaps there should be a radiologic assessment of the caliber of the airway preoperatively such that you develop a prediction of whether or not a tongue reduction surgery will open the airway to a normal diameter. and of course, as you say, the nose and palate need to be addressed at the same time or the tongue surgery may not work. but I suspect that there is a subset of individuals out there for whom a tongue surgery would improve their daytime breathing and functioning, irregardless of the effect on their OSA. I suspect these patients are not being recognized by their doctors as having an airway problem. what can be done to increase awareness of this issue? I think it could start with the training of radiologists to perform lateral neck Xrays properly and to also accurately assess the diameter of the airway as a routine part of their reading of the film. I believe our assessment of what a normal human airway diameter is, is skewed, and so what they are taught in terms of normal caliber needs to be addressed. Also, a lateral neck Xray should be a routine test performed in the evaluation of a patient with anxiety, panic disorder, or any breathing problem. This was an enormously helpful article. Im aproaching the surgeries outlined above and really appreciated this article in its thoroughness of real concerns. Dr Kezerian as always, exudes sincerety and continues to remind me that he is a leader in the world in sleep apnea. The first part of answering your question is figuring out why you are having discomfort. That would come from speaking with you directly and examining you in person. A full evaluation may require some sort of testing, whether something as straightforward as an X-ray or something more involved. The second part is that, technically, both procedures could be released. This is not truly a reversal, however. Whether this would help you depends on the reason for your discomfort and whether this would help. The hyoid suspension is more easily released and would likely have more chance of helping whatever discomfort you are experiencing. I am from Sydney, and i have been diagnosed with severe OSA. I used CPAP for a while & i was not comfortable with it & hence had to discontinue. Thank you for the e-mail. In Sydney, I would contact Carsten Palme. He is an otolaryngologist–head and neck surgeon at Westmead Hospital with whom I have worked on research trials. However, he is not someone who would perform MMA. I would expect that you would be looking for an oral and maxillofacial surgeon if you are looking for someone in Australia. I was seen by an ENT here in San Diego, Calif. I have been complaining for over a year that there is something in my throat and it is very bothersome. The ENT scoped my throat and said my throat’s diameter was smaller than that of a writing pen. Also, my lingual tonsils are touching the other side of my throat which explains what I feel all the time. He says I also suffer from sleep apnea and need to lose weight. He was not concerned that my throat was so narrow, however, I am concerned. I belong to the Sharp Rees-Stealy Medical Group and I am wondering if you know of a good ENT in this group that could help me. I am planning on sending an email to my primary care demanding a lateral neck x-ray and an accurate assessment of the diameter of my airway. Any other suggestions you can offer will be greatly appreciated. I wonder if my insurance would allow me to go outside my medical group and possibly see you? Looking forward to hearing from you. Your website is extremely informative and has given me new hope in finding a proper treatment. Thank you. Thank you for the comments about the website. I do not know anyone in your Medical Group. I see patients from all around the world because there are relatively few surgeons that specialize in this area and few surgeons that perform many of the procedures you see on my website. It should be possible–although perhaps not easy–to obtain a referral to see me at USC. The lateral neck X-ray or some sort of CT scan or MRI to evaluate the diameter of your airway are not necessarily key in sleep apnea. The key is evaluating you first in the office, assuming you have had a sleep study showing obstructive sleep apnea and been unable to tolerate positive airway pressure therapy (CPAP, for example). Thank you for your prompt reply. Based on the insight you have provided, I have not been properly evaluated. I will be referred to another ENT within the group for a second opinion. The first ENT suspected sleep apnea but never requested a sleep study. He opined that my lingual tonsils are the cause of my airway obstruction but provided no possible medical treatment. Hopefully, I will have more definite answers in the upcoming weeks. Most importantly, I will request a referral to see you if this involves any type of throat surgery.